This is an older book, printed in 1990, and is hard to find in bookstores and libraries. It’s still in print, though, and it can be ordered from Amazon. I got lucky and found a used copy at Powell’s when we visited Portland last week. If you don’t write in this genre, I don’t know how helpful this book would be to you, but if this is your genre, it’s a must own. I had been reluctant to order it sight unseen, especially since the publishing information in it is pretty dated. However, the world building chapter alone makes the book worth buying. 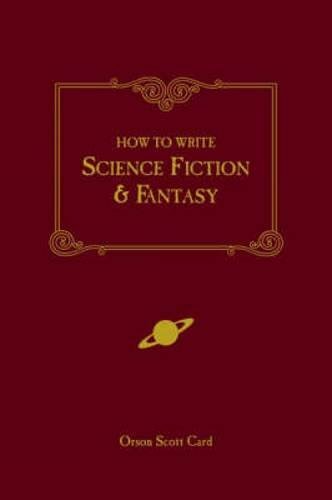 In fact, there was so much good stuff, after these Ten Tips, I’m going to do two more posts specifically dealing with creating languages and the four basic SF and fantasy story models. 1. Mistakes are often the beginning of the best ideas. OSC notes that because they weren’t intended, they are rarely clichéd. So if you can figure out why the mistake isn’t a mistake at all, you could have something fresh and wonderful. 2. When world building, remember that a great event in history or a new innovation never has only one result. For example, the invention of the car didn’t produce only a new form of transportation. Other results included drive-in movies, drive-thru windows, freeways, pollution, the political ramifications of OPEC, and some would even argue two Gulf wars. 3. Establish the rules of your world early, and then don’t break them. Yes, you need rules. Your story will be stronger and your readers will crave some sort of order so they can make sense of your world. You can’t have gravity one minute and gone the next, at least without a good reason, or you’ll just confuse people. Also, don’t make the solution to your hero’s problem at the end of the book that he found a work around to a major rule or that he is exempt from the rule. This is cheating. Your readers will rightfully throw your book across the room. 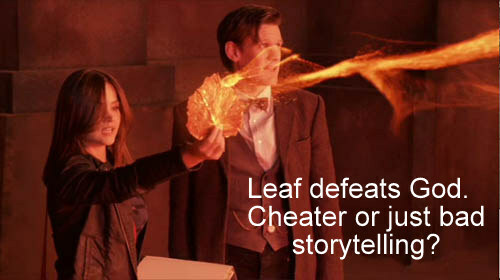 Just because Doctor Who does it routinely doesn’t make it right. 4. Magic should cost something. This isn’t a hard and fast rule as much as a suggestion. I’ve read good books where magic was essentially free. However, I will say the best fantasy books I’ve read deal with the idea that to gain the power of magic, you must sacrifice something. If you want to see a beautifully written example of this, read Laini Taylor’s Daugher of Smoke and Bone trilogy. 5. When writing aliens, creatures, or a new race, you should determine why, in evolutionary terms, their unusual features would have developed. You don’t have to give the mechanics of how, but you do need to think about why the features have survival value. “It’s cool,” is not a legitimate reason. This will give your characters and world more depth and believability. 6. Remember that the hero, main character, and the viewpoint character don’t all have to be the same person. OSC reminds us that the most important character and the one that makes everything happen is sometimes a slimeball. He also cautions against making kings, queens, and other royalty the point of view character because while they have a lot of power, they don’t generally have much freedom of movement. 7. Know both the history and biography of your towns and characters. I did not follow this rule with my first novel, and it really came back to haunt me. Even if you don’t intend to give this background information (in fact, a lot of times that would be unnecessary and just slow down your action), you need to know the how and the why. Otherwise, your readers can end up confused by your characters’ motivations and actions. By the third book I knew why my characters where doing what they were doing, but it meant a lot of rewrites for that first book. 8. Avoid exposition dump in dialogue. Those of us writing SF and fantasy have a lot more to explain up front because of our new worlds, rules of magic, etc. The good news is readers of the genre tend to be more patient and will give you some time to explain. What they can’t stomach is terrible exposition. Don’t unload a ton of details into dialogue so that your characters are having unrealistic conversations about stuff they already now. For an example of this, watch any episode of Castle. 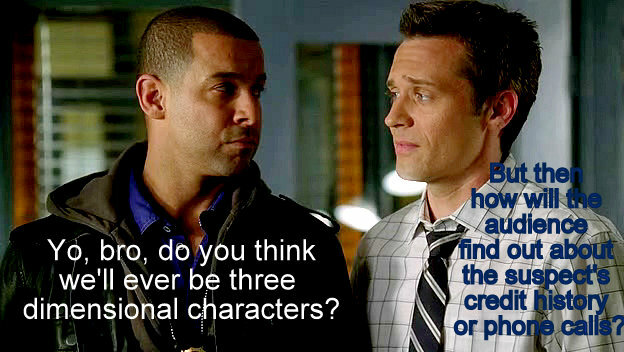 Sometimes I think Ryan and Esposito’s characters are only there to rattle off facts of the case that the writers were too lazy to show us. a. The story I am now working on is the greatest work of genius ever written in English. b. The story I am now working on is worthless drivel. You need A when deciding to mail the story out, B when revising, A when choosing which market to submit to, B when the story is rejected (of course, I expected to get this back), and A when sending it back out again. If this post was helpful to you, I highly recommend checking out Michelle Proulx’s recent post about world building and population. Heck, just follow her. Michelle is not only helpful, but highly entertaining. Yeah. I’m a pro with B. Writer of drivel, that’s me. Every so often I have these beautiful moments of, “Wow, I just wrote something good,” but mostly I’m your basic needy artistic type.